"I'm building a home worthy of a unicorn." Netflix has debuted a trailer for indie comedy Unicorn Store, the feature directorial debut of actress Brie Larson (aka Captain Marvel). This originally premiered back in 2017 at the Toronto Film Festival, before Larson rocked the screen as Captain Marvel, and also stopped by the Edinburgh Film Festival last year. It received dismal reviews and was buried pretty quickly. Netflix is finally giving the film a release this April, if anyone is still curious. Larson's Unicorn Store also stars Brie Larson as a woman named Kit who receives a mysterious invitation that would fulfill her childhood dreams of having a unicorn. Described as a "quirky and offbeat story that's delivered with real charm and affection." The cast includes Samuel L. Jackson, Bradley Whitford, Joan Cusack, Martha MacIsaac, Karan Soni, Ryan Hansen, Annaleigh Ashford, Hamish Linklater, & Mamoudou Athie. Quirky but fun. Brie Larson plays Kit, a unicorn-obsessed art student who must face reality when her art dreams are dashed. An oddball life lesson comes in the form of flamboyant salesman (Samuel L. Jackson), who claims to be able to help her adopt her own unicorn if she fulfills a series of chores and instructions. Unicorn Store is directed by American actress / filmmaker Brie Larson, making her feature directorial debut with this after a few other short films previously. The screenplay is written by Samantha McIntyre. This initially premiered at the Toronto Film Festival in 2017, and it also played at the Edinburgh Film Festival last year. 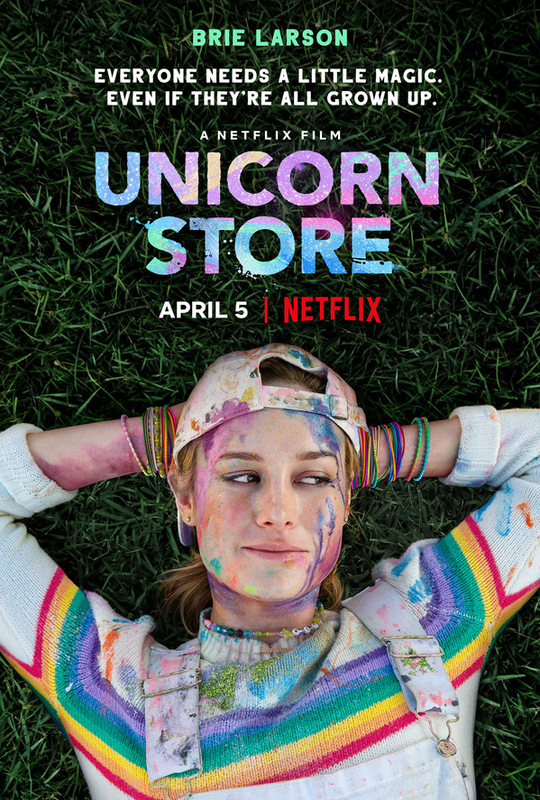 Netflix will release Larson's Unicorn Store streaming exclusively starting on April 5th this spring. Curious?